Over the years I have posted many bias related posts (see the collection below), but it's just occurred to me that I never shown you how to sew on bias. 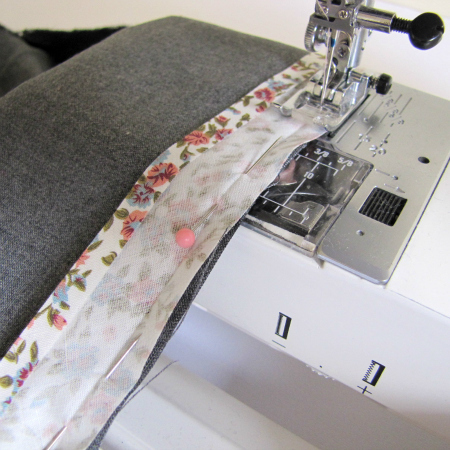 Many of you have problems catching the back when sewing bias on so I'll show you a trick so that it catches every time. 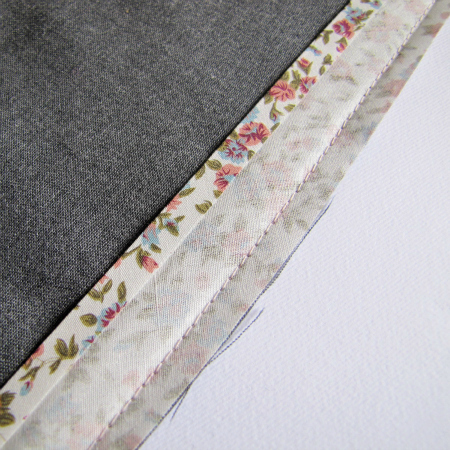 I will do a series of posts showing you how to sew on bias, do corners and finish bias. Today we start with sewing bias on. 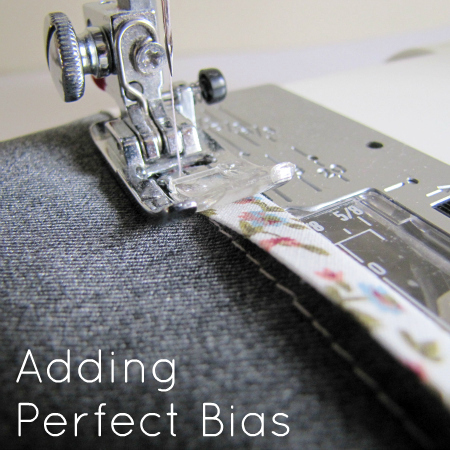 Start by placing your opened bias fold to the edge of your fabric. Right side of your bias will be placed against the wrong side of your fabric. Pin. Turn over so your right side of main fabric is facing up and press bias away from the edge. If you turn your fabric back over it should look like this. OK, the trick to making sure your second row of stitching catches the back bias edge is all about the first stitching line and not the bias inself. 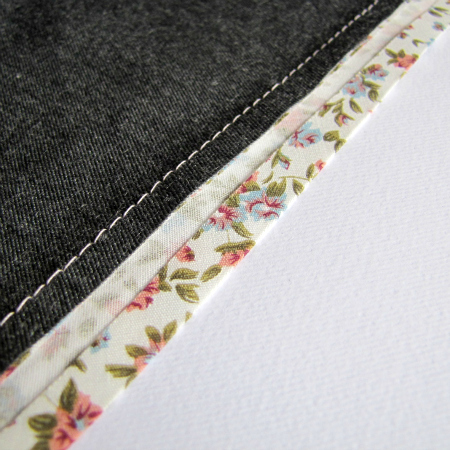 Make sure your second row is above the original stitching line (towards the fabric edge). If it falls on top or below it then it won't catch at the back. Do this by pressing your bias top edge just a smidge over the stitching row - this keeps everything straight as well. Sew your top row on the right side of your fabric like a top stitch about 1/8" (not as close as an edge stitch about 1/16") . Your stitching must be above the original row of stitching. This is how it will look both front & back. 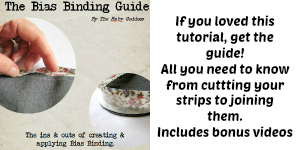 This comprehensive digital guide covers finding the grain, corners, cutting & joining strips, curves, finishing off, gadgets & more. Only $5.95 and it's delivered immediately to your inbox! 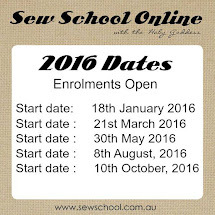 Looking for a sewing lessons online? Awesome, thank you so much for the step by step guide. I've seen so many so called tutorials that show a picture of the pinning stage but then miss the rest. I'll definitely give this method a go! Oh thankyou for this great tip! I can't wait to put it to use :) ~ Gina. What a great tutorial! Your photos & instructions have made attaching bias foolproof! Thanks for sharing. Thanx for the great tutorial. Been trying for days to put an eyeglass case together and I finally see an end to this project. Thank you for the tip I will be trying this today, I am sure it will help. Brilliant! I've started doing bias binding for place mats but haven't been satisfied with my method. I can't wait to try this! Wonderful tutorial, thanks so much. I've put a link to it in my blog www.sewforsoul.blogspot.co.uk. This is so helpful! I used bias binding on my bathrobe and just folded it over the edge and hoped for the best. Needless to say it came out a little wonky... Thank yo for sharing! Thanks so much. I am making a cot quilt for my first grandchild, and will be at the binding stage soon. WOW! After years and years of sewing, now I finally get it! Thanks for an easy to understand tutorial. I'm so glad that I came across your site. Sweet! Thank YOU for this tutorial. Into 40s and 50s vintage style I will be using bias tape (and piping) oh so much in the projects to come. I am so glad you posted this tutorial,I really needed it. I assume this is for crafts or clothing as sewing a top stitch on the front of a quilt binding is a big no no for judges. But VERY good tutorial for comprehension. One of the first things I learned to sew with is bias tape, but I could never catch the back properly. Over time, I just started hand stitching the second row of stitches. After this tip, I think I will finally be able to do it right. That's really helpful. Arthritis is making using a hand needle more and more difficult. Thank you. Holy moly! Where was this tutorial 2 Christmas's ago? It's brilliant! It's awesome! 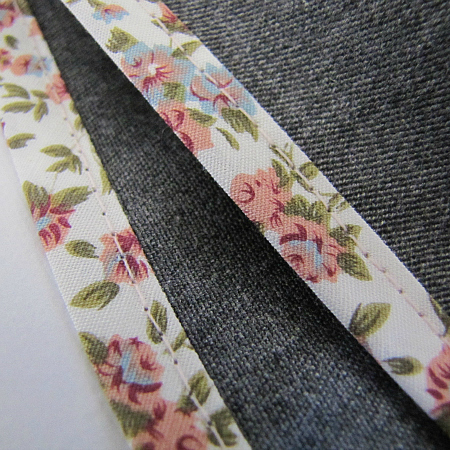 You've just erased all my frustrations with sewing double bias tape!! Muah! Thanks for a great tutorial. I won't need to handsew the second side any longer. The tutorial photos would be even better if you either used a fabric that had a very different right and wrong side design, or if you labeled and right and wrong sides on the photos. And I was stumped for a few minutes on "Turn over so your right side of main fabric is facing up and press bias away from the edge" until I realized you meant "With the wrong side of the fabric still facing you, flip the bias tape over so the seam you just sewed is hidden, then turn the fabric over so your right side of main fabric is facing up and press the seam flat." I bookmarked your site a couple of days ago because your blog impresses me. Your tutorial is so easy to follow and I'm trying this right now with the fabric for dressmaking I ordered a week ago. Thank you for the tutorial, this is an area I have a ton of problems with and your instructions made my day! 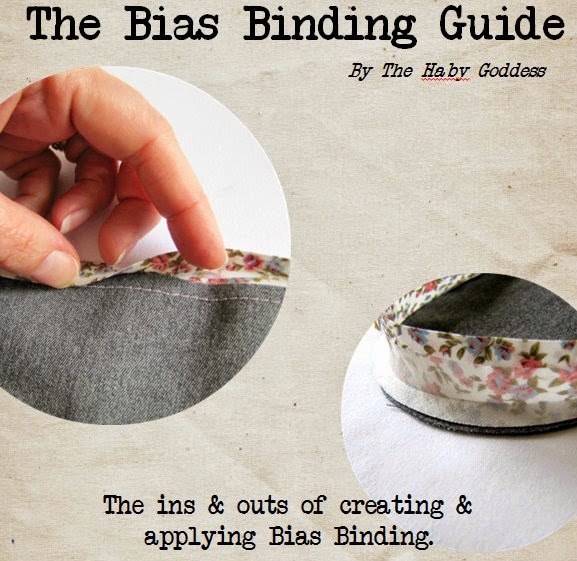 Nice series of posts for sewing on bias binding, you've explained it very well! Thanks! I linked to this post from my blog, you can see it here. 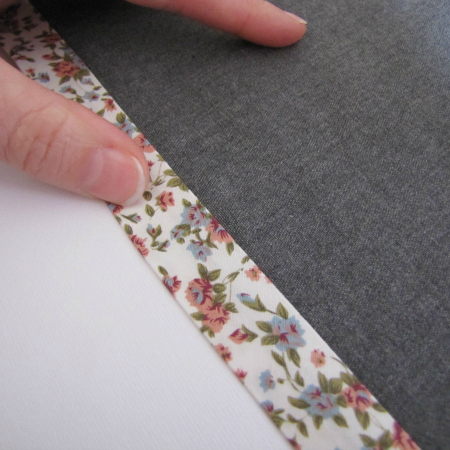 If you or your readers buy pre-folded bias tape, you'll notice one side is slightly wider in order for it to fall above the first stitching line as you describe. If you pin the bias tape with the narrower side, when you fold it over it should already be mostly lined up. Very good tutorial. believe you used single fold bias tape. I frequently use double fold bias tape and have found that the last fold is not in the middle. 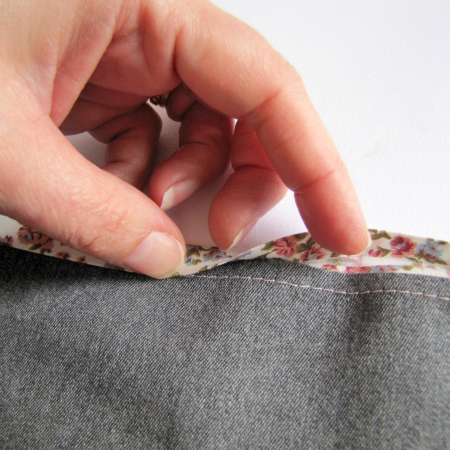 It is offset, so sew the shorter side first fold and the longer other side will cover the first seam like you show. Took me quite a while to figure it out.